HD library of contemporary acronym video clips. Is there a better alternative to Clips for iMovie? Is Clips for iMovie really the best app in Video category? Will Clips for iMovie work good on macOS 10.13.4? Clips for iMovie…Boost your iMovie editing! This app delivers an HD library of High-Impact video clips featuring contemporary acronyms. FML, LOL, WTF, FTW, TMI - That's what we're talking about! Use them in your iMovie creations! Each clip is a carefully crafted visual and aural experience. All are polished motion-graphics HD clips presented with styled humor & expression! Drag these clips right into iMovie projects for the ultimate in comic relief and entertainment. Put your productions "over the top" and blow your friends & family away with killer videos! New Toolbar icons & improved tableView. Clips for iMovie needs a review. Be the first to review this app and get the discussion started! Clips for iMovie needs a rating. Be the first to rate this app and get the discussion started! Over 40 Different Clips, each are up to 10 seconds long. The clips use contemporary acronym style expressions. iMovie editing is great fun, extend the experience! App provides easy scroll viewing & saving. No further connectivity required. Supports iMovie 09, 11. Final Cut Express 4.0.1, Final Cut Pro 6.6, 7. Simply save the desired clips to your computer and import into projects, or drag and drop into iMovie's Events Library window as a New Event, or into a Final Cut bin. All videos are in 720P HD, and will work in any editing program with h264 file support. 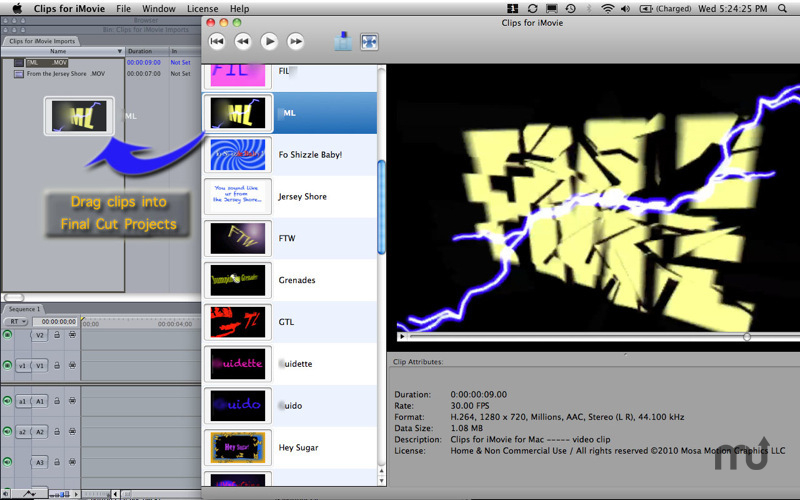 This is not an editing program, it's a library of clips - clips that can be imported into iMovie for easy editing. iMovie comes with every Mac, extend your iMovie editing pleasure.